The delicious Greek pepper grows on plant that matures to approximately 30". The pepper is delicious and sweet. A high-yeilding plant, it produces an abundance of these versatile peppers. The Pepperoncini Pepper is sweet and have a very mild heat. 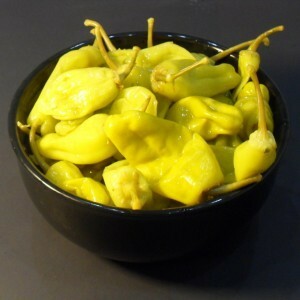 The Pepperoncini is mild with a slight heat and a hint of bitterness, has a complex flavor which is appreciated most when it is eaten fresh and is pickled and sold in jars.